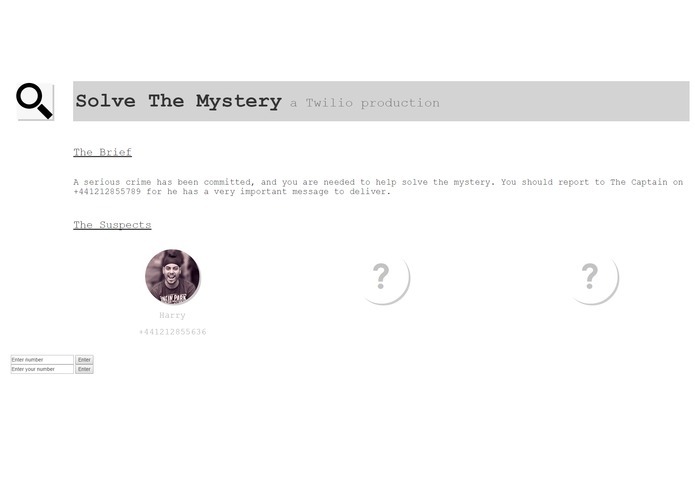 We wanted to use Twilio, because we really liked the idea and it looked fun. We started thinking of what we could do and came up with a murder mystery involving calling and texting some numbers to get clues, leading you to solve the mystery (or not as the case may be). We built a website to help people follow what is actually going on, while they call/text numbers given to them by the website/the people they are contacting. We are really proud of how we tied the message logs into the website, and made it so that each person can have their own log, using their mobile phone number.